No doubt about it, August is the hottest time of the year. Although summer is filled with a variety of fun activities, it’s easy to feel overheated in a short amount of time. However, there’s no area quite as relaxing as your backyard patio. Following a hectic day, the only activity you want to participate in is relaxing outside… but you can’t. It’s just too darn hot, so you slink back indoors. However, you could cool things off significantly in your favorite outdoor area by installing an outdoor umbrella to provide you with much-needed shade. You’ll quickly discover that a variety of different umbrellas can be found in-store and online. How do you know which umbrella is right for you? Let’s further discuss outdoor umbrellas. First of all, you don’t want a behemoth umbrella taking over your entire outdoor area. You need to find an umbrella size that fits in well with your patio or backyard layout. How much shade are you looking for the umbrella to provide? The general rule of thumb is that the umbrella should be about five feet larger than the area that you want to be shaded. For the most part, umbrellas are either six feet in diameter or nine feet in diameter. Most likely, your umbrella will have either a metal or a wooden frame. Keep in mind that wooden frames cannot rotate and generally open using a pulley and pin. However, metal umbrellas can be cranked open and some of them are able to rotate. 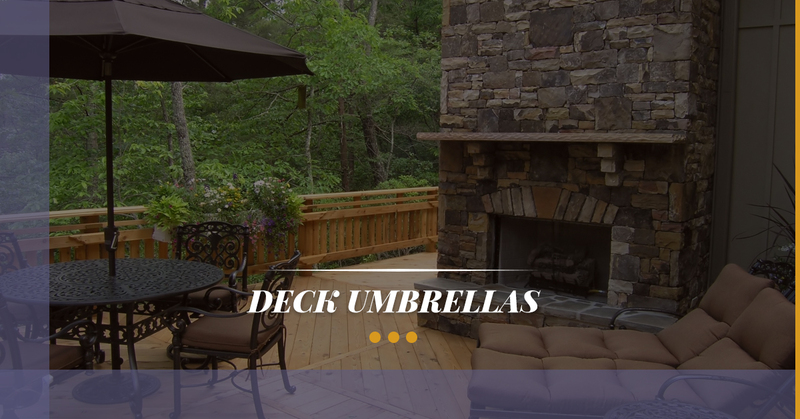 Cantilever umbrellas refer to deck umbrellas with a pole set to the side that is attached to its own base. Basically, this type of umbrella hangs over an area such as a table without taking up additional space in the center. With a cantilever umbrella, you won’t have an irritating pole in the middle of your table, which can get in the way. Depending on the time of day, the sun moves in different directions, so having an umbrella that tilts is optimal. Tilt umbrellas are an excellent choice for people who enjoy spending long periods of time outdoors. Crank tilts are incredibly popular because they are so easy to use. All you have to do is crank the umbrella open and tilt it. Push-button tilt umbrellas use a crank to open and close, but a button is pushed to control the tilt. Once the button is pushed, the person must manually adjust the tilt to his or her liking. If your ultimate goal is to stay as cool as possible on a hot summer day, consider purchasing an umbrella with a breathable fabric. This type of fabric is waterproof but still lets water vapor pass through. You could also look into fabrics that are UV, weather, and mildew resistant for longevity. Stay cool the rest of the summer by buying one of our deck umbrellas at Spa Hearth & Home. Our friendly, knowledgeable staff at our outdoor furniture store in Maple Shade is happy to find you the perfect umbrella.